Both coat and dress are done now.Â Woven, cut, sewn, hemmed, lined – DONE, DONE, DONE!! 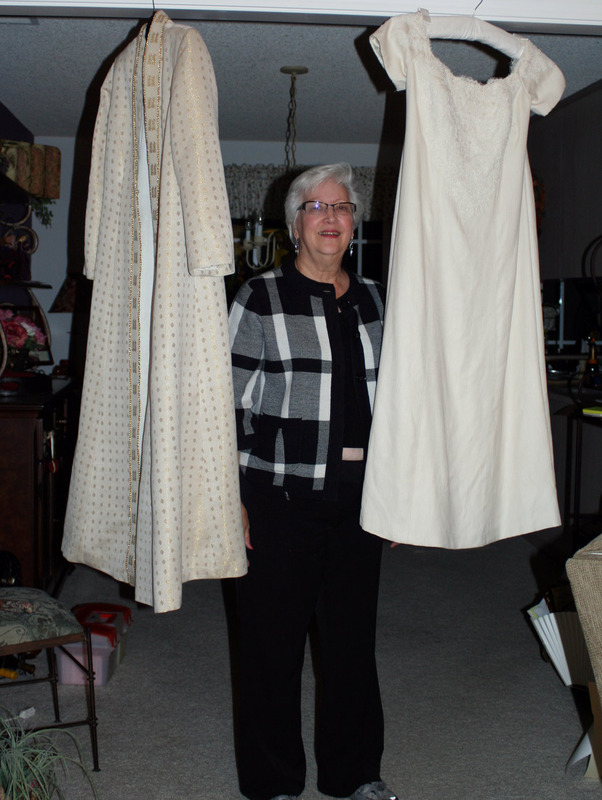 !Â Sharon and I broke out a bottle of champagne to celebrate last night, and then (for the last time) I took the garments home.Â They are carefully folded, stowed safely in garment bags, awaiting their appraisal this weekend and their Big Moment in June. First, to Sharon.Â Her help has been invaluable, both in fitting and inÂ sewing the dress.Â The perfect fit, the flow, and more complicated sewing are her work, and she provided the guidance to me as I did the bulk of the work.Â Without it, I could never have completed either coat or dress a tenth as well. Second, to the handweaving community for helping me through many technical issues as I sampled, studied, and eventually learned how to weave the fabric for the dress.Â Without you, the fabric would have been much poorer, and the path at least twice as difficult. Third, to my mother, for teaching me fiber arts as a child.Â If not for you, I might never have gotten into fiber arts, and none of this would have been possible. And, finally, to YOU, my blog readers, for cheering me on through the difficult parts, and celebrating my successes with me.Â Your support meant a lot to me, especially in the days when I wondered whether I’d EVER finish this thing, or if it would be a tenth as beautiful as the dress of my dreams.Â It is, and I’m grateful for your support along the way. Beautiful! You will be a beautiful bride for sure! Congratulations too on planning and weaving the fabric for your dress and coat. I am so glad to see the finished photos of them. Your hard work and incredible design sense has been an inspiration to all of us. Thank you for sharing the process with us. And THANK YOU for sharing this incredible experience with us. I have learned so much from you….. not the least of which is to HAVE COURAGE and try new things. Congratulations! Wish I could see it in person.